Working in secure comms, we come across many interesting and varied characters, all with a different background story to tell. Recently I met Mark Howells, a reservist with the Royal Signals, and formerly a full timer, having seen several tours of active service. Mark has been instrumental in setting up a new cyber protection team within his regiment, and we’ve talked shop on several occasions. However, what really got my interest was when Mark started to tell me about the proactive steps he was taking to deal with his Post Traumatic Stress Syndrome (PTSD). Depending on which source to you go to, PTSD affects from 5 – 10% of military personnel, and is on the increase. Although the increase could be because it is now a recognised condition, that is talked about, and so people feel more able to ask for help. Whichever way you look at it, mental health is something that we all need to be aware of. Mark told me how he found cycling was a great therapy helping him to manage his symptoms, and so continue an active and healthy lifestyle. With coaching from the Army, and a strict training regime, Mark has achieved a lot. Not only that, he has big ambitions. 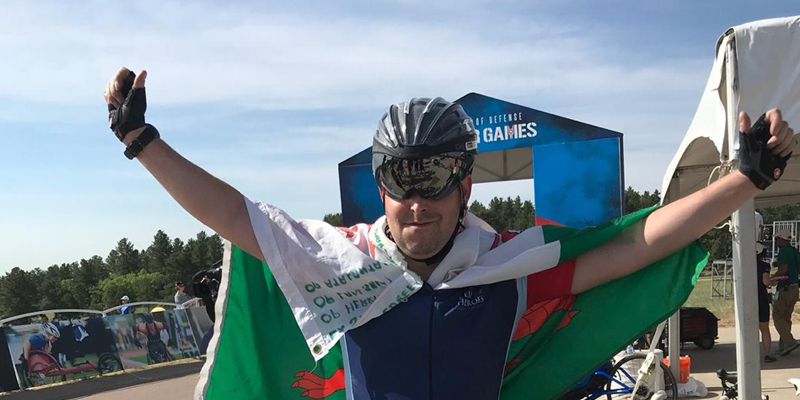 Mark’s goal is to represent his country at the Invictus Games in 2020. Meanwhile he is taking part in events every week, and has a packed schedule of races for the coming season. At Armour we are very proud to support Mark in his endeavours, and will publish occasional posts here, to up date you of his progress.